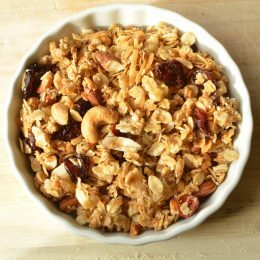 In a large bowl combine the oats, nuts, coconut, brown sugar. Separately mix syrup, oil, salt. Then combine both mixtures together. Pour onto baking sheet, 2 small, or one large. Cook for 1 hour 15 minutes, stir every 15 minutes to achieve an even golden brown. Remove from oven, and toss in a bowl with the cranberries. Store in an airtight container until ready to eat.